Many years ago, I wrote a little song about the Rev. Dr. Martin Luther King Jr.’s famous “I Have A Dream” speech. I had always been a big fan of MLK’s speeches and writing and I wanted to create an easy-to-sing song that would take these big ideas and make them “singable” for kids. Little did I know that the songs would soon become of the most popular classrooms songs for sharing the life and legacy of MLK across the country. 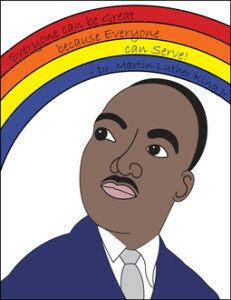 Get All Of My MLK-Resources Free! What will you be doing on MLK Day 2017? Whatever it is, take a moment to recall this great leader who changed the face of our nation through compassion, real moral strength and love. Everyone understands what it’s like to dream. And this time of year, many families are preparing for a day of service in honor of Martin Luther King, Jr. and his dream of a fairer, kinder and more peaceful world. But how do you talk about big concepts like compassion and social justice with young children? You can start with simple songs like this one that use easy, repeatable phrases to sing the praises of a great American hero. Here’s an animation of the song and complete lyrics are below. Need more than a song? Check out the links and resources below for free posters, coloring pages and lyric sheet. The “I Have A Dream” song and MLK’s timeless message are perfect for a day of service or any time of year! Along with raising a creative and intelligent child, you’ve probably also been thinking about how to encourage your child to be kind, empathetic and caring. With MLK day approaching quickly, here’s a song that you can use to gently teach about the life and legacy of a man that overcame evil with good and dedicated his life to service to others and a quest for equality. The “I Have a Dream” song came out in 2006 and has been used extensively in classrooms, homeschool settings and special presentations all across the USA. The lyrics are simple and very singable, making this a great song for even the youngest listener. And we can all be queens and “kings”. During the month of January 2015, all DARIA’s resources for MLK Day have been marked down to “free” other TeachersPayTeachers site. Links to these January freebies are below. if you download, would you kindly consider “following” DARIA’s TPT store? Thanks!